Beehive: Street cat is now my pet! Hello :) I'll warn you immediately if you're not a cat person do not read the rest of this post. I'll begin now. So, a while back we saw this cat just wondering around my building. Then we saw her again, and again, and again. (I'm convinced that it's a she.) And before we knew it, she became local-house pet. Me and few more neighbors were taking care of her; bringing her food and water. After some time I tried to get closer and I succeeded in petting her. Before I knew it, I was going out just to check on her, I had to say "hello" every day before I went to college and every day when I got home. I knew she had two places where I could find her so I had to look at both just to make sure she was there. And she was beautiful. She was fluffy, black with white markings and amazing green eyes. And she was so cute and nice. Of course, I tried to find her home but nobody would take her. I couldn't do it myself because my family doesn't want pets. End of story. Anyhow, I called some animal shelters; even they turned me down. So I said I would wait some more time and try again. I actually never got the chance because someone took her. (My neighbor says so.) Now, looking at her, you wouldn't say she was a street cat; she was too fat for it (you know how stray cats and other animals are usually skin and bones). I fell in love with her immediately and I was kinda heartbroken when she was gone. I know she wasn't mine, but she was. She was my pet. She was the closest thing I got to a pet over here. And I miss her every day. That's weird, right? I don't know. Now we have a new stray-pet cat here and we even built her a house (cause it's winter and she can't sleep outside anymore). She seems to like it, I saw her in there few times. She is also fed every day. And I like this one too, but this one is more shy and not really like a pet. 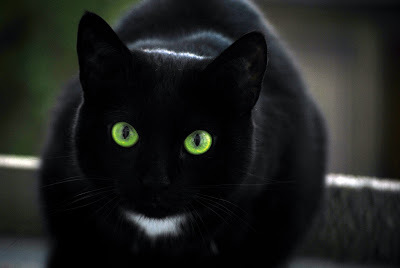 The weird thing happened one day when I saw a black cat just like mine Kitty and I called her hoping she would react like Kitty always did. But it didn't. I knew it wasn't her but I hoped maybe she lost some weight or something and I didn't recognize her at first. Anyway. I miss my Kitty. I can't wait to get my own place to have pets. What are your thoughts about this? Do you have a pet? Cat or a dog person?